I am a fan of the long con. I’ve play some fantastic practical jokes on people. This ranks right up there but I think the joke was on me because of all the extra work I did. This is the story…my good friend Cheryl scheduled to receive an award. It was supposed to be a secret, as these awards often are. As part of the ceremony, it is common practice to give the recipient a cloak. I was asked to provide the cloak. Since I have been using her daughter as a model for several dresses, it wasn’t a stretch for me to ask Cheryl to model something for a new project. 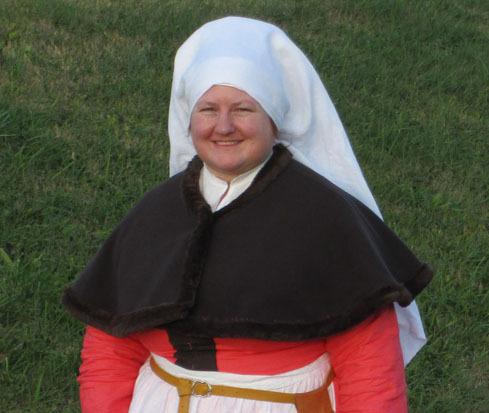 I told her that I was going to teach a class on German cloaks so I needed to make some class samples. I made a great show of making patterns for her daughter, our friend Laura and then Cheryl. After I had all the patterns, I thought, well why don’t I just go ahead and make a display anyway. D’oh! What was I thinking? 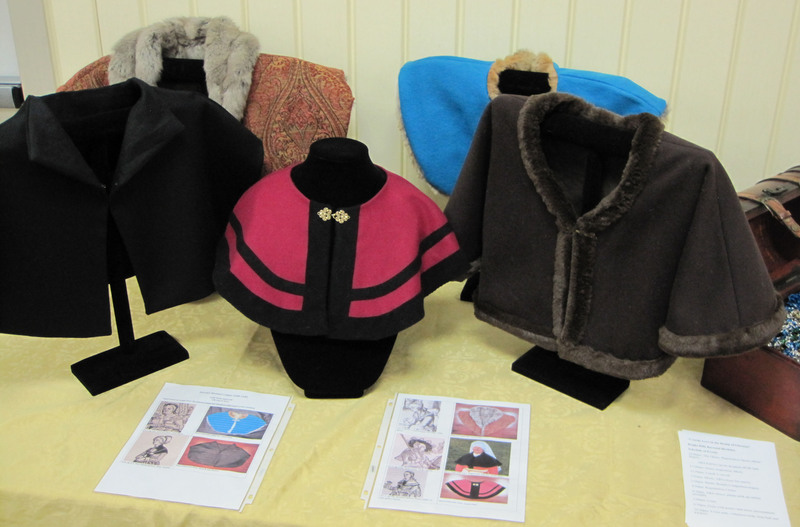 I made several capes and displayed them at the event where Cheryl was getting her award. Fooled her! 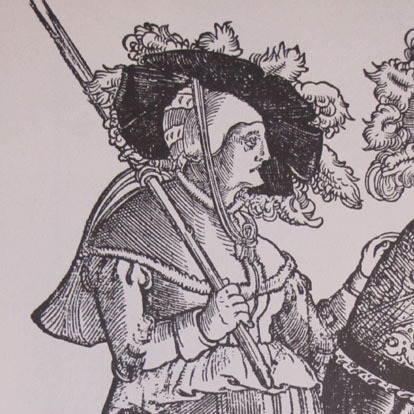 All these capes are based on on images from The German Single-leaf Woodcut 1500-1550 by Max Geisberg. This display gives a good overview of the variety of styles for a simple German garment. Going back to 2011, this is the second cape I made. 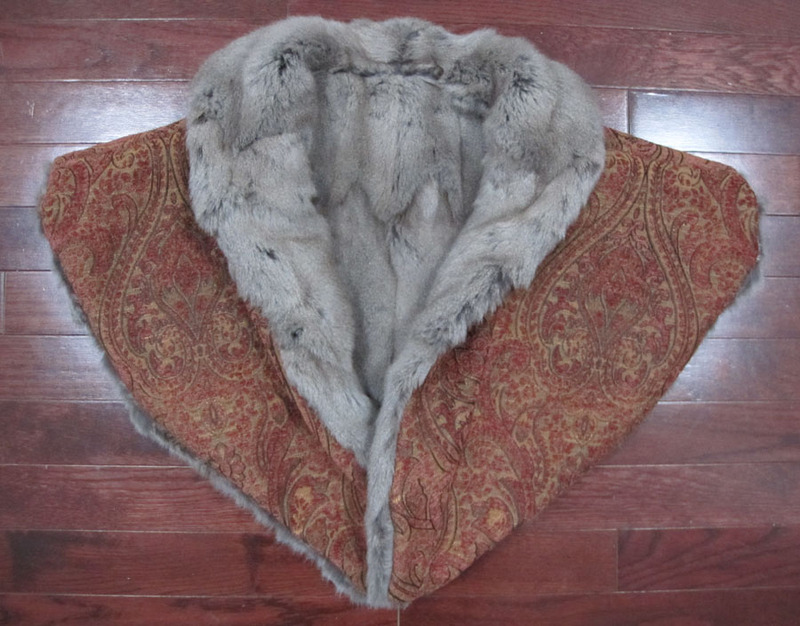 It is wool lined with linen and edged with fake fur. The first one was completely lined with fake fur and much too poofy. 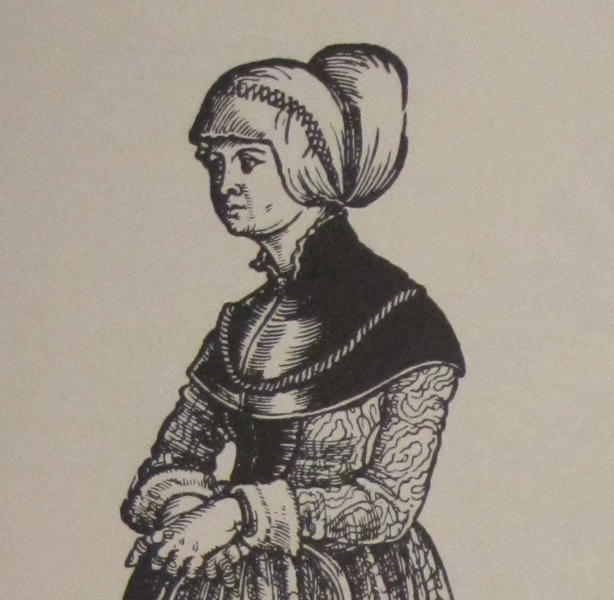 My brown cape is based on this: Vol 3, pg 1326, Niklas Stoer, 1538, Vienna, though mine is a little longer at the shoulders. Fast forward to 2013. 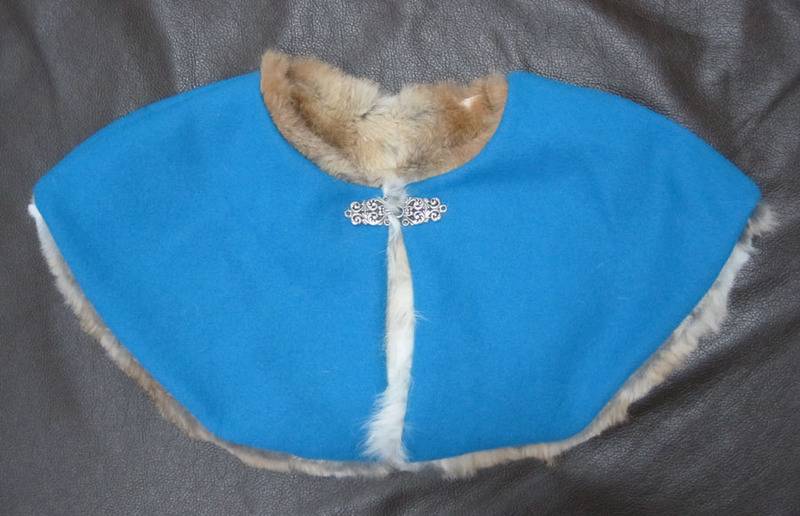 This cape is made from blue wool lined with rabbit fur. 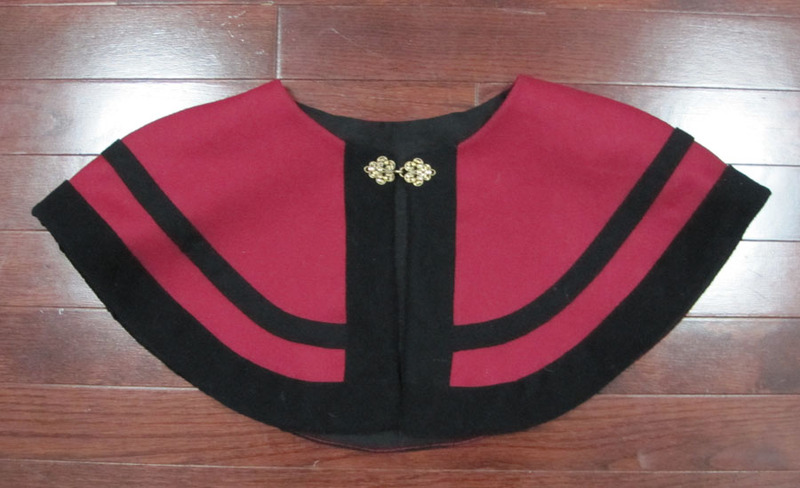 Red wool, black wool trim, lined with linen. 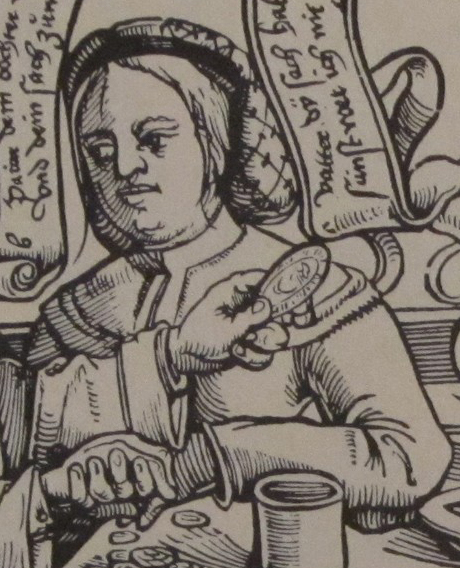 The red cape is based on a woodcut: Vol 1, pg 136, Barthem Beham (1502-1540), no date given, Vienna. This seemed to be everyone’s favorite at the event. 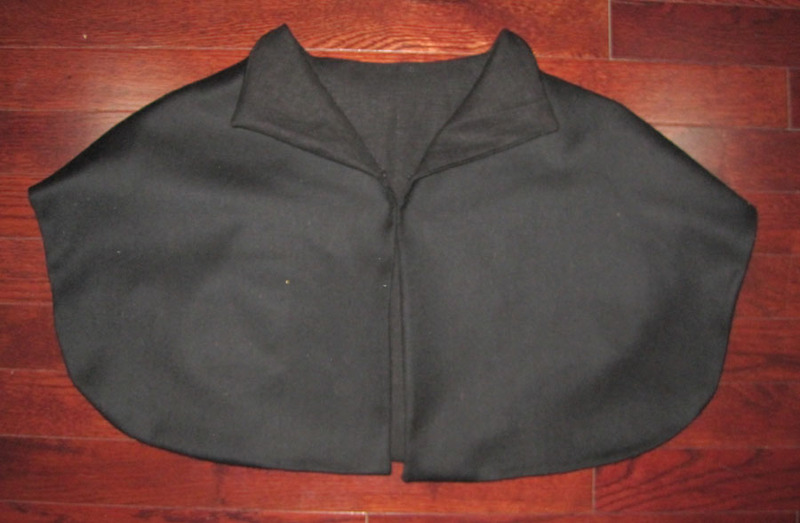 Black wool cape lined with linen. This was the stunt cape. It was in my display for all to see, including Cheryl. 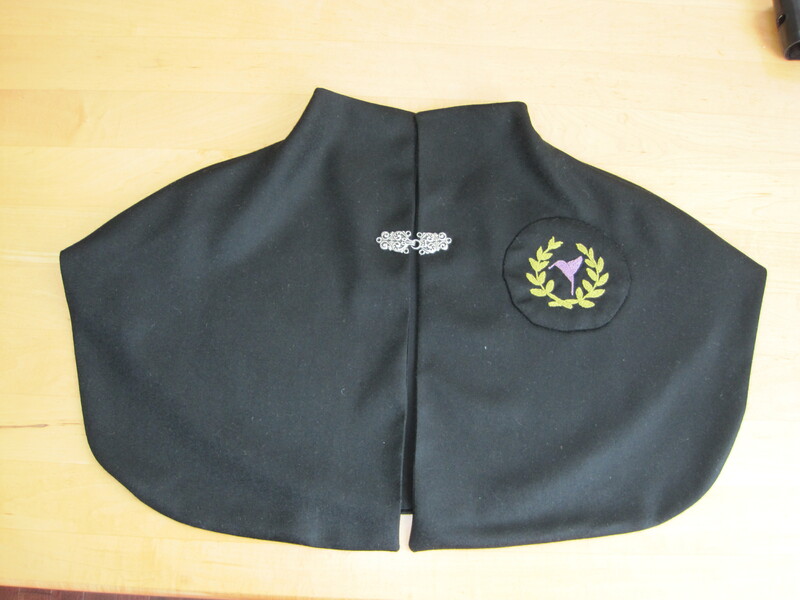 She didn’t know I made another one of the same wool, lined with silk and decorated with her laurel badge. 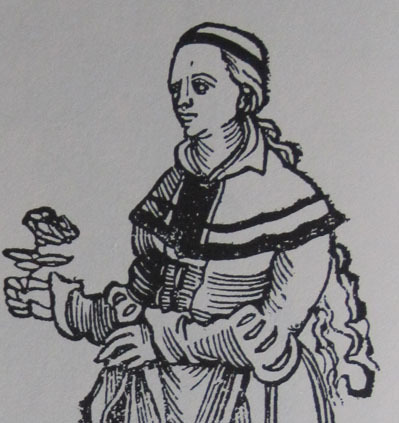 Cheryl’s cape is based on this woodcut: Vol1, pg 227, Hans Sebald Beham, 1531, Dresden. Cheryl wearing her cape during her laurel ceremony, February 9, 2013. There were two versions of the final cape. This is the second. I wanted to work with real squirrel fur, as the Germans did. My husband bought a used fur coat for me online so I could take it apart and repurpose the fur. This cape is for my friend Laura who likes orange and red. It’s not done yet. The edges have to be tacked down because the fur will roll and you can’t iron fur to keep it in place. 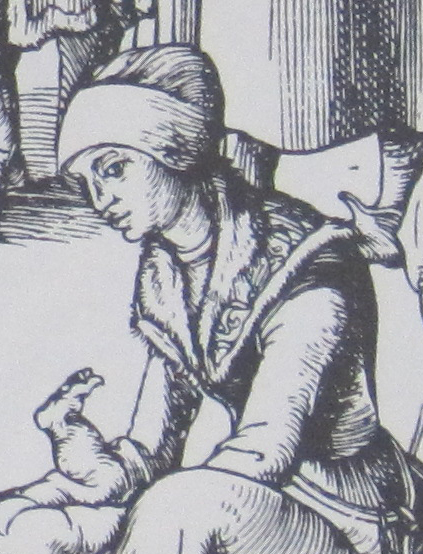 The squirrel fur cape is based on this woodcut: Vol 2, pg 527, Lucas Cranach The Elder, 1509, Berlin.